So having tried most everything on my list, today's brunch was at Serangoon Gardens, 5 minutes from the house we are staying in. Once we got to the roundabout, Ming and I were at a lost where to go, so we went into this corner shop that had a few stalls. 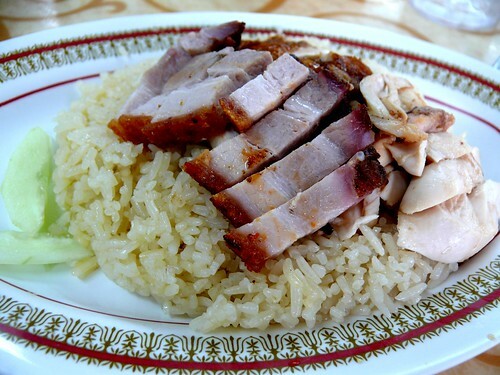 Roasted pork and chicken rice. We ordered roasted pork and chicken rice from a stall called Posin, if I'm not mistaken, and it was not worthy (rice was hoong/stale) for my princess mouth so I ordered Sing laksa from the next stall, one last time. And what do you know, it was the closest to the Sing laksa of my childhood ('youth' being too telling) days when I visited Sing. 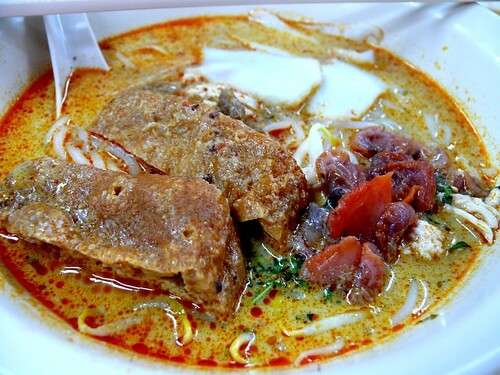 That is the main reason I like Sing laksa, Bryan, that they remind me of my early teen years. Plus Sing laksa is delicious, if cooked well. Although oily, the santan was not terribly thick. There were fried tofu puffs, bean sprouts and even fish slices, and I'm happy because that's quite close to fishballs. Best of all were the raw cockles (which I pushed into the soup after taking this photo) which were big, sweet and crunchy versus the tiny, bland and tough (overcooked) cockles we get in Sabah. 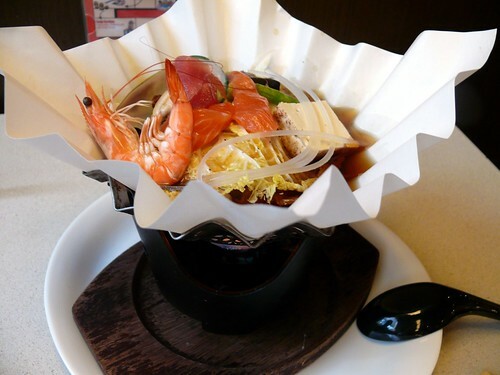 Each time I eat cockles, it is like a step of faith and thrill, like how eating fugu would feel like I suppose. Faith in that they won't give me food poisoning or hepatitis A. Hub wouldn't touch them; he's a very careful person whereas I'm a risk-taker. And a glutton. But I don't eat cockles when I'm in Sabah, because I imagine that they are harvested from under some stilt-houses where the toilet is a hole in the wooden floor. Maybe that's why in Sabah cockles are cooked until they are tough. Ming likes cockles but finds them rather fishy and bloody. Strange isn't it, that these bivalves have blood? We ended up on Orchard again. Really, Singapore still has such a looonnngg way to go before it gets to the shopping status of Hong Kong. The whole 8/9 days I was there, I think we went to Orchard 6/7 times. And each time it's either Takashimaya or Tang's or Centrepoint or Paragon. We avoid Lucky Plaza because it's a conmen's den. But go to HK and you'd panic as each day goes by because you haven't even covered half the malls or 0.0005% of the eateries in a week. 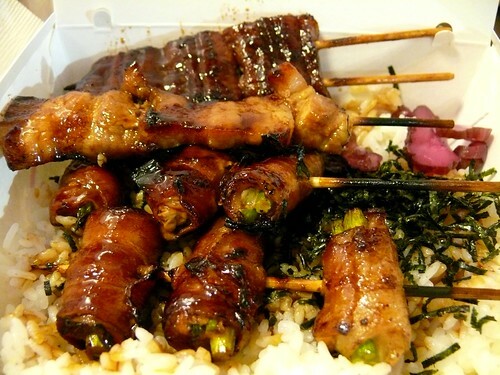 Bacon asparagus rolls (9.5/10), pork belly yakitori (9.5/10) and unagi yakitori (8/10) on rice. No full marks because they were too salty but still, one of my best meals. Sometimes the simplest is the best, don't you agree? As you can imagine, we were really quite sick of eating out by then. We went to the Chomp Chomp foodcourt on the way home but nothing appealed to us. I was appalled by the filth and wet floors (it was drizzling and when I slipped on the pavement, all I was concerned about was that I didn't get spit on my jeans or sweater...) while Ming felt everything was too greasy. We ended up cooking instant noodles with lots of spinach, mushrooms and beef. Man, it was great. 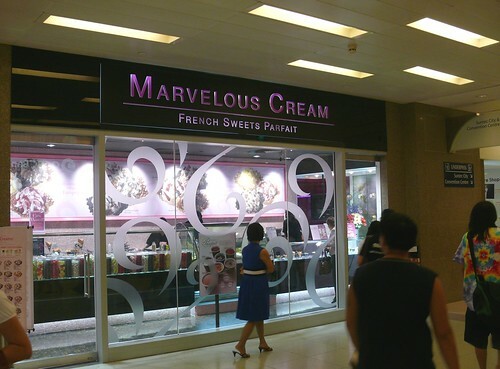 This is an ice-cream parlor in Raffles' Link. Unfortunately we were too full, but I think the ice cream must really be heavenly. 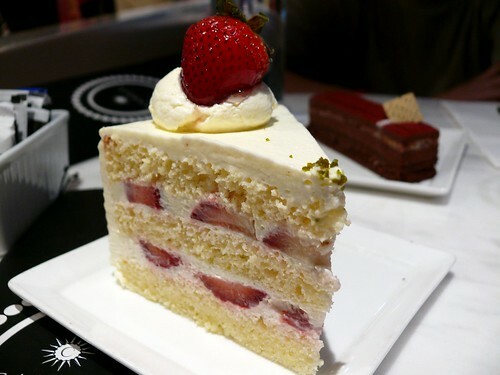 They have a large array of fresh & dried fruits and other pretty toppings and upon your order, they slap the ice cream on a piece of ice-cold stone and mix in your choice of flavors and toppings using a metal blade. Must try next trip. Singapore has so many areas where we Malaysians can learn from. It is probably the greenest city around. There are big trees everywhere, all well-manicured and healthy. 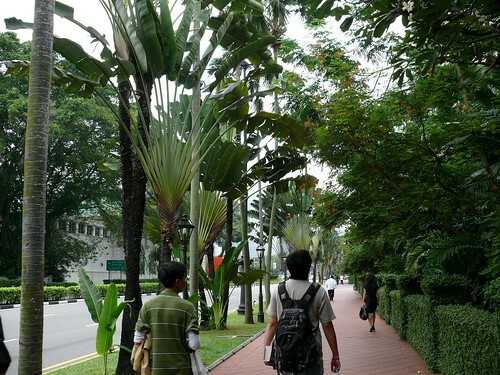 The trees keep the air fresh and cools the city. Here in KK, baldness is not just on men over 40. Most of our roads are bare on both sides, and if they do plant anything, it'd be small bushes or palm trees that give no shade. Another thing is the cleanliness (no litter or spit), the safety (most houses do not have iron grilles; we walk home at hight never feeling any fear), taxis are everywhere and they run efficiently. Makes me wish Sabah had joined Sing instead (agree with you Greg). Talking of taxis, we always chat with taxi drivers every place we go and Singapore taxi drivers seem to sing the same anti-gov't song. They'll always start with "Singapore is better than Malaysia, no need to argue about that." And we don't. Then they get bolder ("We have nothing here, even our sand and water need to be bought from Malaysia!") and angrier ("Who dares say anything against the gov't?! You never heard of Temasek and Hutchinson?") They like their PM though ("Good guy, not involved in business.") Hmm. I need to talk to the taxi drivers of KL. I bet they are an angry lot too. The only thing we shouldn't learn from Singapore is English (I'm on dangerous ground I know). They are proud of their 'Singlish' so they will go on saying " Bok" (pork) and "Lor" (an emphasis). But then to be fair, will the Malays stop saying "bing" for pink and Chinese-Malaysians "Wan doo tree" for 1 2 3? Just kidding lah, don't get too upset. Described as "64% dark choc mousse.almond succes.hazelnut feullitine.choc genoise with rum," this is truly delicious with many flavors and texture. A marvelous creation! S$7/RM17/US$5.30, not cheap. 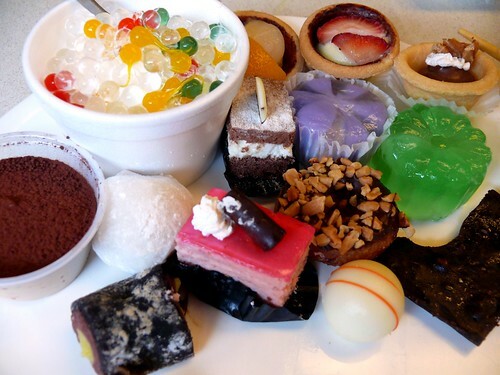 I would eat this again when I go to Singapore. Btw, does anyone know what 'succes' is? Why this is called strawberry shortcake I don't know because the shortcakes I have eaten in the States have a scone-like texture. This cake wasn't crumbly enough for a shortcake yet too coarse for a sponge cake (its only flaw; I was disappointed) but it was saved by being moist to the point of wet. 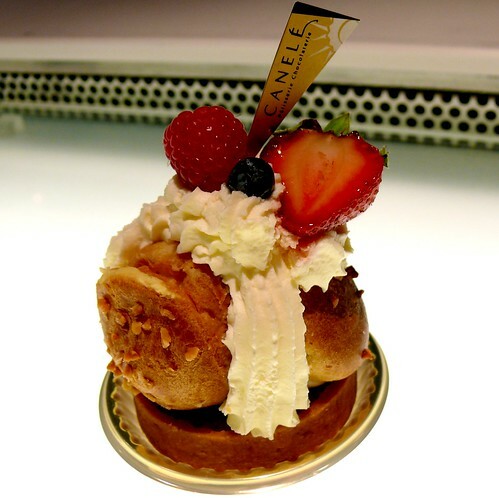 It scored 100 points on flavor, is not too sweet, and we loved the whipped chantilly cream. S$8/RM19/US$6, expensive. 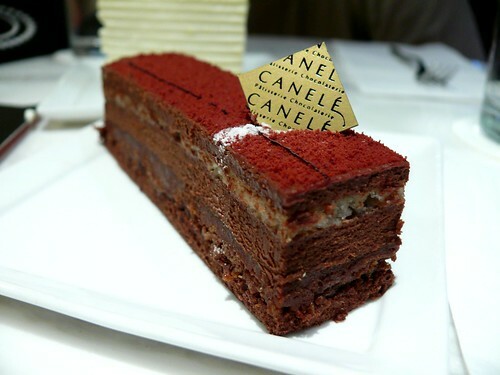 When I next go to Singapore, I'll reserve a day when I don't eat anything but Canele's cakes. One of each kind they have. We rushed to Katong Shopping Centre because F had given me the address of a shop that sells designer glasses at very reasonable prices. We got there after 8.30 pm and the place was closed. Took a cab home and a block down, I saw 328 Katong and, like in a movie, cried "Stop!" and we got off. Still had to pay S$3/RM7?US$2.30. Singapore laksa and otak otak. This time 49 Hock Hong Hin was not out of laksa. I found it less santany than 328, but still too santany for my liking. 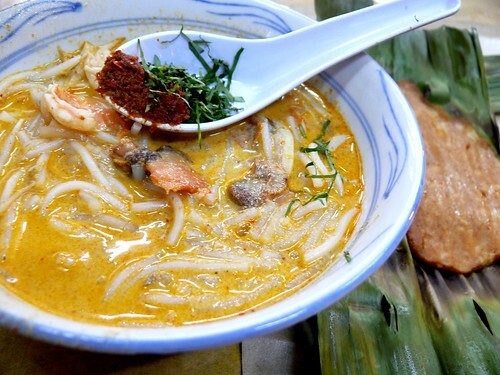 We were told that the authentic 328 laksa place snips their noodles short and does not provide chopsticks. Well, here's news. Both 49 and 328 do not provide chopsticks, only spoons, so who's the real McCoy? 49's otak was ordinary but then I don't like otak. Weird food. Today we are completely on our own, Ming and I. We are actually enjoying each other's company. He tells me about the Warhammer book he's reading (in the cab, in the subway, walking...he who has never read more than 10 novels in his life), music, jokes, technical things and I try to listen. I think we both know we are completely dependent on each other now that Hub has gone home and F is busy with her work. He, for my money and me, for security and street direction. Hey, isn't it supposed to the the other way around? We went to Vivo City, the biggest mall in Singapore I'm told. Now, how big can a 'biggest mall' in Singapore be, since the island state is only 42km x 14 km at the widest points, giving only 690 sq km ("Size of a booger" said the Taiwan foreign minister in 2004)? I'd say Vivo City is a waste of time (but remember, that's my opinion so don't get all heated up). It is quite a big mall, full of shops but nothing I'd want to buy. We saw Sushi Tei, and hurried in. Now I've never liked sushi on trains but I was ready to be impressed so we sat at the train bar. Having missed out on toro at the Tzukiji Market in Japan, it's been my quest ever since to eat toro, something that Jerry Steingarten made to sound like a gastronomic climax. Since the waitress said we could order sushi items that were not on the train, that's what I did. Ikura topped chawan mushi S$7/RM17/US$5.30. 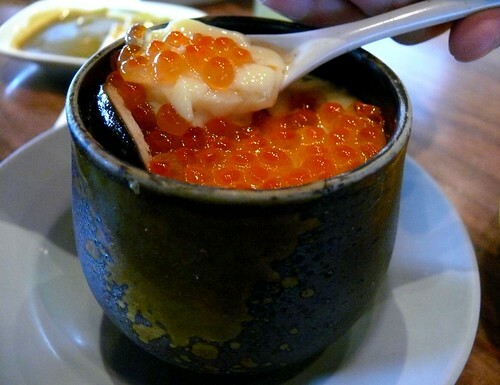 While the egg custard was excellent--so soft yet held together and flavor just nice--the ikura was fishy. But what do I expect, it's salmon eggs. Otoro sushi S$8/RM19/US$6, clam sushi S$4/RM9.60/US$3, belly salmon S$2.80/RM7/US$2 and soft shell crab maki S$6/RM14/US$4.50. When I saw otoro sushi on the menu for S$8, I snickered. So cheap! But when it came looking more like faded maguro, I wasn't snickering anymore. Now it looks like I'm paying too much for an ordinary piece of tuna. Ok, maybe it was between maguro and chu toro. (Maguro 101: maguro is bluefin tuna, prized by the Japanese. 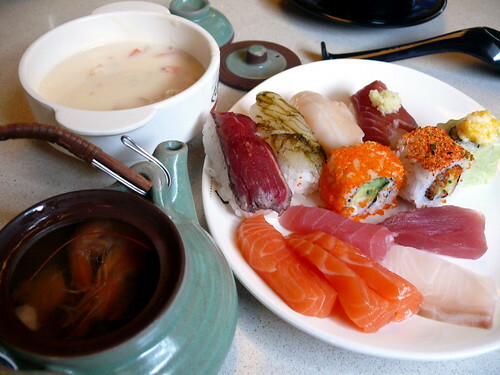 When Jap eat sushi and sashimi, they prefer maguro and not sake or salmon like the rest of us. The reason why maguro tastes so bland in KK (I dare not include other Malaysian cities) is because ordinary tuna is used, not the bluefin! The belly meat of the maguro is called toro and is the most prized and expensive part of the fish because of the fat and the small portion available. The toro is divided into chu toro and otoro, the most expensive being otoro. Superior otoro is nearly white in color.) I ate my piece of otoro. The earth didn't shake. The sky didn't fall. It was like the maguro I usually eat in KK (which means bland), more soft than buttery. And it was fishy! Ming turned to me, not sure if it was an Emperor's New Clothes Moment, and said "Kinda fishy huh?" We went on to the salmon belly (looking at my bill now, there may have been a mistake because S$2.80 seems too cheap for salmon belly). Another disappointment. Ok, so it wasn't sashimi, but still it was sliced so thin I couldn't quite taste any difference between it and the regular salmon. The clam was crunchy-chewy and good. The soft shell crab sushi was quite good. But you know, the most surprising thing about the sushi at Sushi Tei Vivo City is that the sushi rice was rather hard, not in the cooked-too-hard-way, but rather chilled or overnight-rice-way. Can't be so , can it? 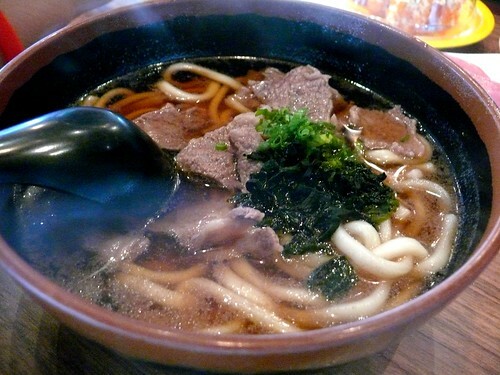 Ming had the beef udon, which he said was very good because the udon was fresh and very el dente. 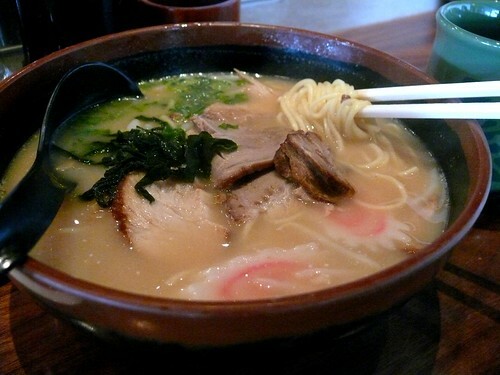 I had the pork ramen, which was quite good and the portion so big I couldn't finish it. All that for S$56.73/RM136/US$42.50, which I thought was not cheap because I didn't get the toro I thought I would get. Ming met up with his classmate Chong (who flew in with his dad for a couple of days) and they found a pet shop (my kids love pet shops) and the Japanese thrift shop Daiso, where everything is just S$2, on the top floor of Vivo. In the pet shop, I saw an ugly dog, a Japanese Chin. It had a strange, funny face with pop-out eyes like the chihuahuas (which I've always found quite ugly too), a scrawny body and a spaced-out expression that tickled me. You know the Chinese saying "One mountain higher than the other"? In the bottom cage I was shocked silent when this pug turned around. It was a French bulldog, with protruding eyes far apart above each of its ears, mouth and nose all scrunched together, big stand-up ears and short little legs. It looked pissed and it was the ugliest dog I've ever seen, so ugly it shut me up. I backed off to see the baby snauchzer, one of my favorite dogs. 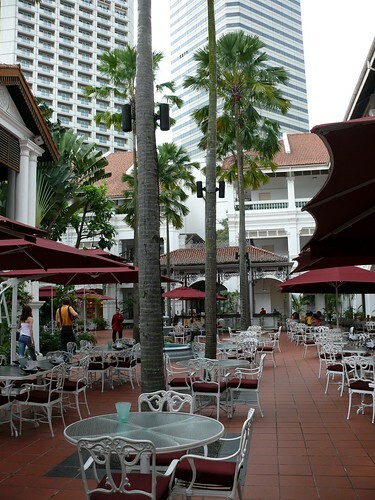 From Vivo, we headed for Raffles Hotel where Rei said I could find a cake ingredients shop. Rei, I walked around the outside of the whole hotel, asked the bellboys (wish I had taken a pic of the Indian doorman who was dressed in a colonial uniform) and yet couldn't find such a shop. 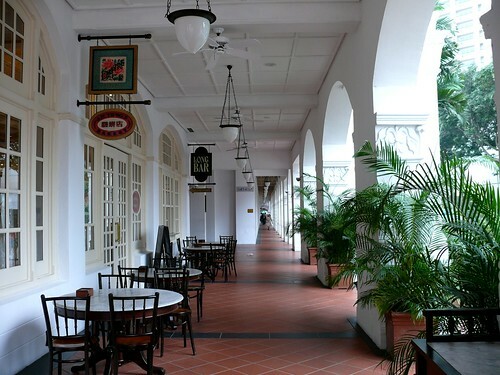 Still, it has been a long time since I last went to Raffles Hotel (where I couldn't afford to stay so I settled for a DKNY shirt and a pair of flats) and the hotel, despite looking out of place and small now, still has its charm and a regal historic air. I am persistent, as you all know by now, especially when it comes to food. I scribbled down a list of places that some of you recommended and I want to cover, if possible, all of them, especially the chicken rice and Sing laksa places. So after shopping on Orchard Rd, we took a cab to Wee Nam Kee Chicken Rice which is at 275 Thompson Rd, Novena Ville. 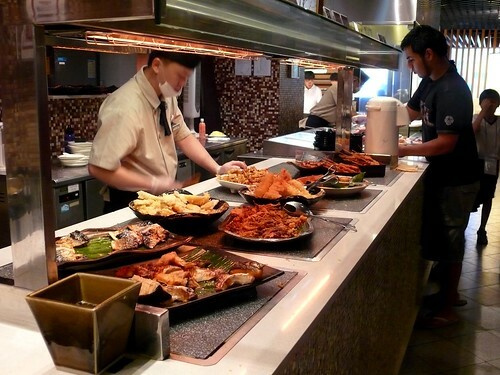 You'll know you are at the right place because of the bright lights and the queue for table. It was 10:30 pm, late for prim and proper Singaporeans, but the place was packed. We weren't particularly hungry but I didn't want to miss a chance to cross out my list. 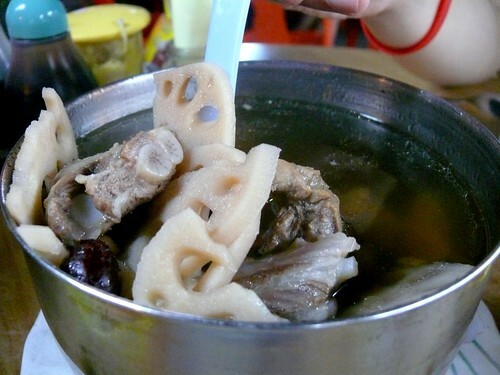 Lotus root pork ribs soup. "Not as good as Na's," said Ming in reference to my MIL's meat & bones-concentrated soups. My own mom cooks soup thin as tap water, so I try to strike a balance between them. Our favorite anytime anywhere, and this though not excellent but still was good. Slippery smooth, soft and soaked in light chicken broth and soy sauce, this is heaven with the rice, soup and veg. Sabah chicken rice chicken is never this smooth and saucy. 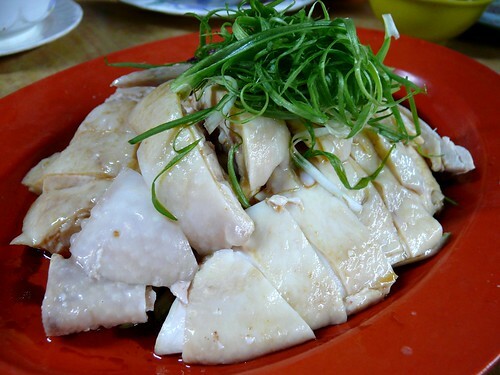 With inflation, Sabah chicken rice chicken has gone from bad to worse as they now chop the chicken into slivers as thin as fries. 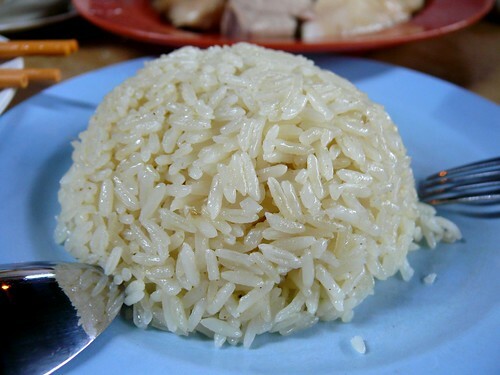 We agreed that the biggest reason why Singapore chicken rice is better than those in Sabah (and F said, better than even those in West Malaysia) is because they use grade A Thai fragrant rice whereas the chicken rice in Sabah is 3rd grade broken and usually 'hoong' or rice grains that's gone stale. 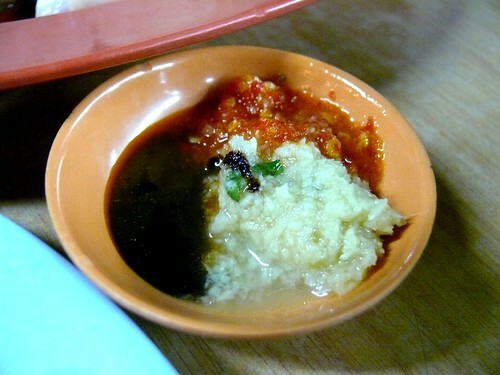 The thick soy sauce, ginger and chili dip. 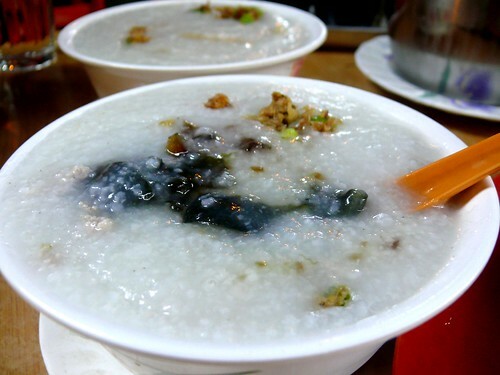 Pork and century egg congee (very good, but I could taste the msg) and cuttlefish congee (nah). We needed to doggy-bag the congee. The bill came to S$40.73/RM90/US$28 including drinks which was okay in Singapore but would be considered expensive in KK, for chicken rice. I wanted to walk home, to burn off the calories, but the others said I was crazy and they would never walk with me so we went home in a cab. Looking at my list, I still need to try Rui Kee Hainan Chicken Rice on North Bridge Rd and Famous Sungai Rd Trishaw Laksa. Maybe tomorrow. 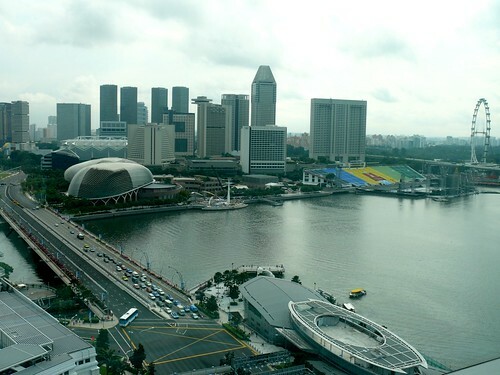 A view of Singapore's skyline from the 18th floor of the HSBC Building. The newer and taller buildings are in the financial district, which was where we were so they can't be seen. Hub and his younger bro were leaving as scheduled this evening. 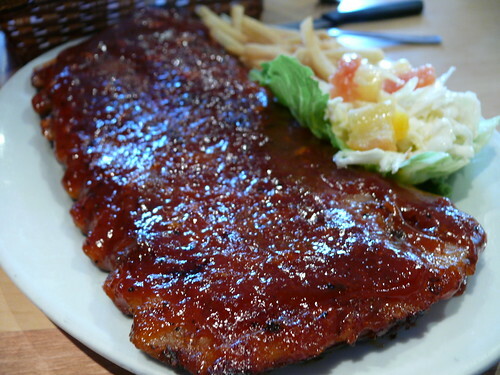 But BIL wanted to to eat Cartel's St Louis' ribs before he goes home. 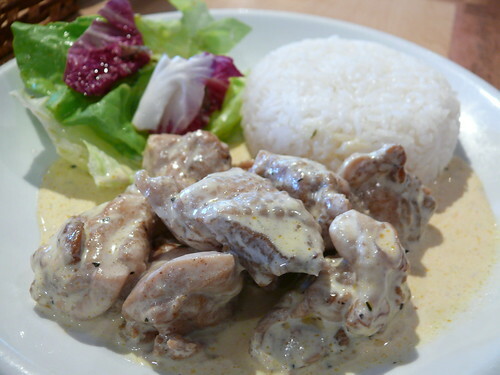 Set lunch at S$9.90/RM24/US$7.40 includes a soup (tastes like packet soup), creamy chicken and rice and a dessert. And all-you-can-eat bread, which is the best item in Cartel. Cartel's St Louis' pork ribs. Not as bad as I expected, but very very salty. F likes the fine things in life (who doesn't). 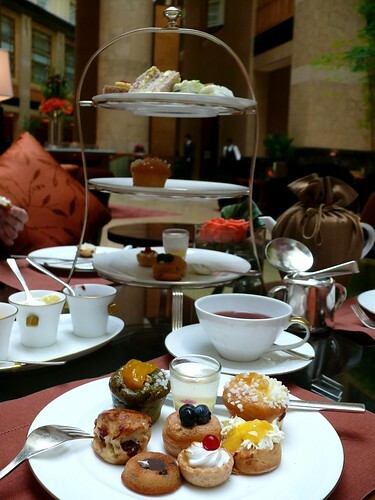 She swears that the afternoon tea at The Fullerton Hotel (TFH) is the best, better than the famed Raffles Hotel, Singapore or Peninsula Hotel, Hong Kong. 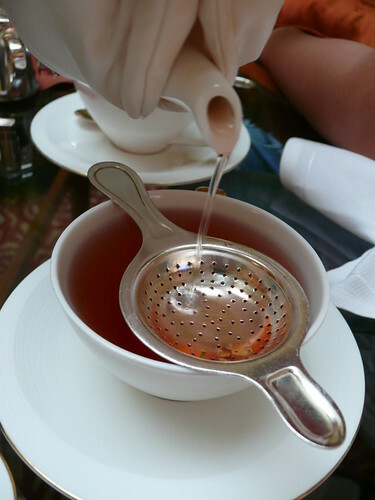 I've been to HK over 20 times but never found time from shopping for the famous tea at Peninsula. I must do it when I go next month. I'm told Four Seasons is not to be missed too. Frankly I have never heard of TFH until last year when my bro Clive pointed it out to me. 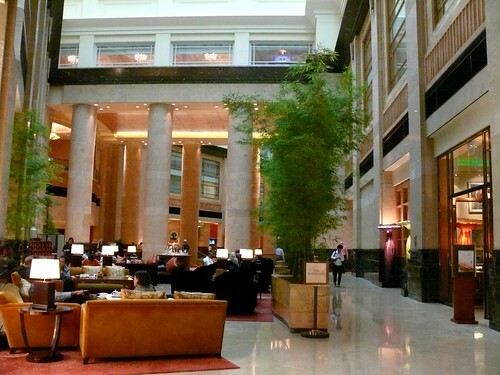 "Most expensive hotel in Singapore," he said. Actually that is not so. 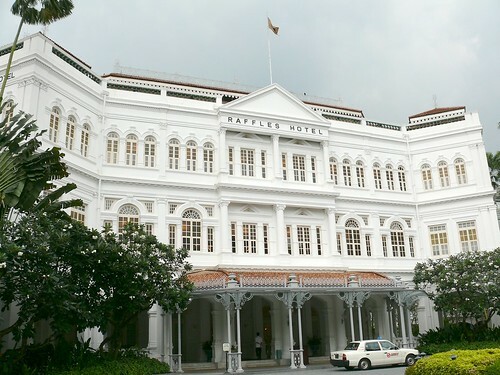 Raffles is still more expensive, and Ritz Carlton is another top hotel. But TFH is more stately and very grand, especially at night when the lights are up. It is in front of the sea and the famous Merlion statue of Singapore is right in front of it. Incidentally, I think it's time to build a bigger Merlion. Anyway, my friend Su was on a business trip the week before I went to Sing and she urged me to go earlier so that I can stay with her at TFH (so nice of you, Su! Invite me again next trip?). I was so tempted, but in the end opted to go later with Hub and Ming. F is extremely kind; she flew down from KL and squeezed in some time for us by taking us to the afternoon tea at TFH when she heard about my missed chance to stay at TFH. 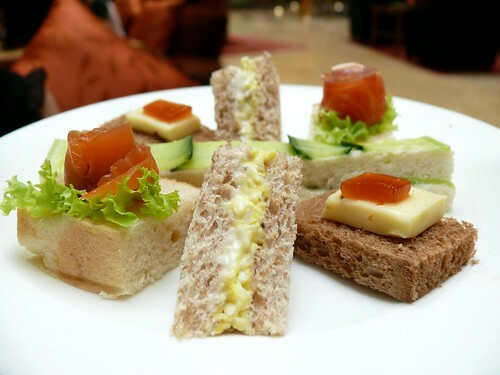 You can choose the Traditional English Afternoon Tea for S$36++/RM86++/US$27++, Tea with a glass of wine for S$46, or Tea with champagne for S$56++. You get a 3-tier tray stand filled with teeny weeny sandwiches and desserts, all golf-ball sized and replenishable. You also get, per person, a choice of two teas and coffees. I chose the Bellini tea, which is a fruity drink; lovely. F had an excellent Earl Grey while Ming chose a Sing-English blend that tasted like cough med. 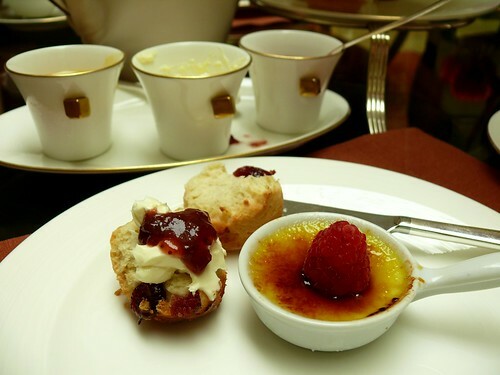 I have never eaten scones with clotted cream before (also in pic, a lovely creme brulee). In Australia, they serve scones with whipped (dairy) cream. The texture of clotted cream is very much like mascarpone, very fine and meltingly smooth, like whipped butter, and not wet and airy like whipped cream. Imagine, clotted cream in Singapore! 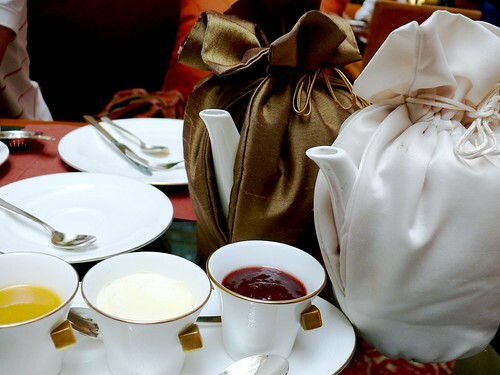 The scones are served with a superb marmalade sauce, clotted cream and a berry jam. I think we had 6 rounds of these, cleaning out the cream each time. 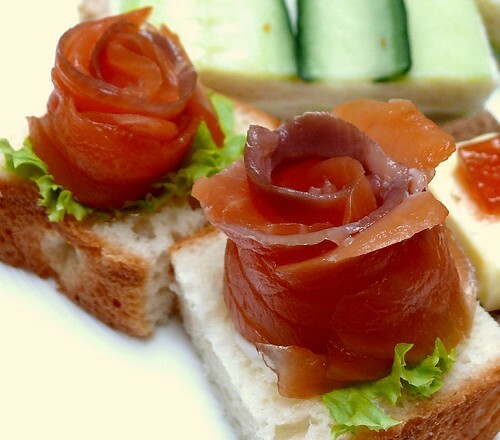 Open sandwiches of cucumber (too wet with butter), smoked salmon, cheese and aspic and very tasty egg mayo. 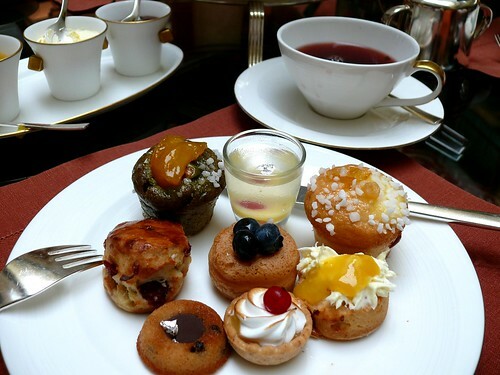 Scones, muffins, tarts, jelly, sponge cakes (some with gold foil which Ming kept eating; they are so light in color they probably are tin foil...) that are only as big as golf balls. TFH's afternoon tea is served off the lobby which I didn't quite like because it was too open. TFH is not opulent, which is nice. I found the inside not as impressive as the outside. 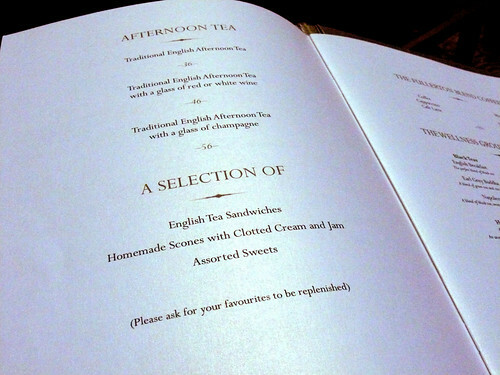 So how do I find TFH's afternoon tea? Very frankly, I think they could expand the selection. For that price, they could throw in some canapes, petit fours, some English ham, a selection of cheeses and throw out the humble muffins even though they were very good. 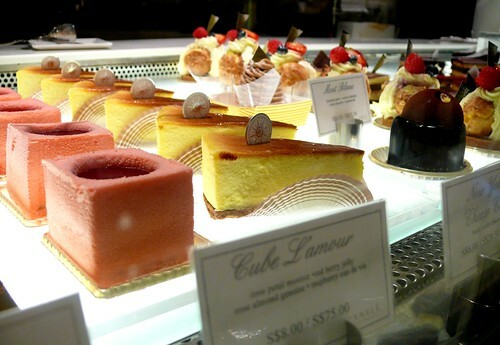 I'd rather have high tea at Cova, only about S$14++ per person. For once even Ming admitted that pricey doesn't necessarily mean the best. 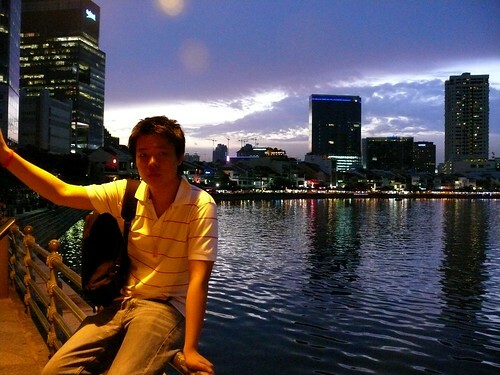 The Poser, with Clarke Quay behind him. After the tea, we walked towards Clarke Quay, which is across the Singapore River. Clarke Quay is a waterfront esplanade of restaurants; very pleasant. 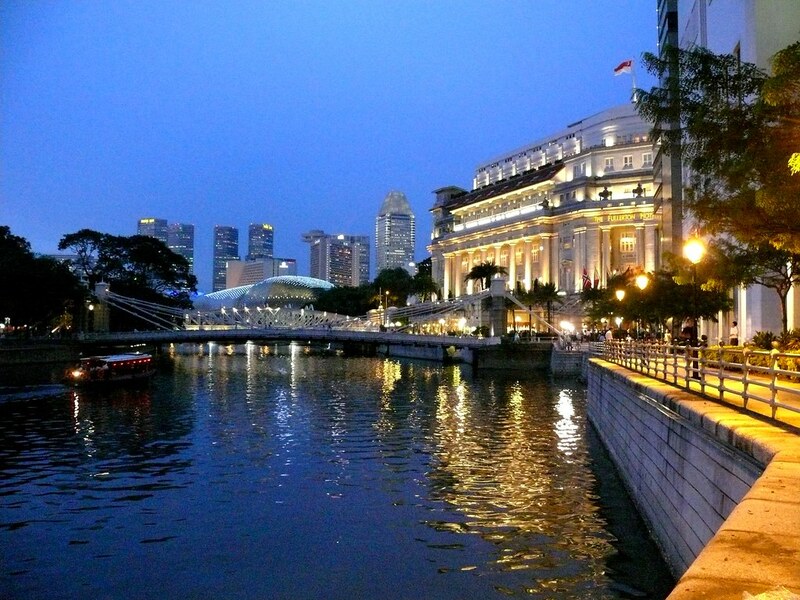 I have always loved South East Asian countries for the warm weather that doesn't require a sweater in the evenings; Singapore is very pleasant because it is very safe and there are no major issues. TFH is the building on the right. Those domes are The Esplanade, the place for concerts, plays and operas. Known to most people as The Durians, I find them to be more like the compound eyes of houseflies. But don't tell that to the Singaporeans. Too bad it was about 8pm, so we skipped Clarke Quay and took a cab to Ngee Ann City on Orchard Rd. We managed a glance at Tiffany's (crowded! ), I considered the stainless steel Tank at Cartier (empty! ), F brought me to Jimmy Choo and Chloe where she had just bought a handbag each last week. We both thought Chanel, Celine, Bally and Fendi were too 'aunty'. I fell in love with Loewe's Nappa Airre (the gold & bronze one) as shown in their display screen, but it was sold out. We both agreed we love Marc Jacobs but On Pedder, the store that sells funky labels such as Marc Jacobs, Miu Miu and Stella McCartney, was closed. The next day, I went back and bought myself a black Gryson Baladyne (Joy Gryson used to be the design director for Marc Jacobs; I prefer bags that aren't so 'It' yet. Plus, her bags are still affordable) which is so heavy it'll probably give me a frozen shoulder, as had the Chloe Paddington that F has since given away. I felt very guilty as I left the store (is it only me? I change my mind the minute I'm out the door!). But while waiting for Ming, I saw an old man on a wheelchair (pushed by a Filipina maid) and his 70-something, very classy and trendy wife. Hung on the wheelchair were big shopping bags, the one outside says 'Burberry'. As they clambored frailly into their chauffer-driven Merck, I reminded myself that money can be earned, but not time. Besides, the bag was 50% off. Because Hub and his younger bro are leaving tomorrow while Ming and I stay back, we gave in to BIL's request to have salty soy bean soup for dinner. 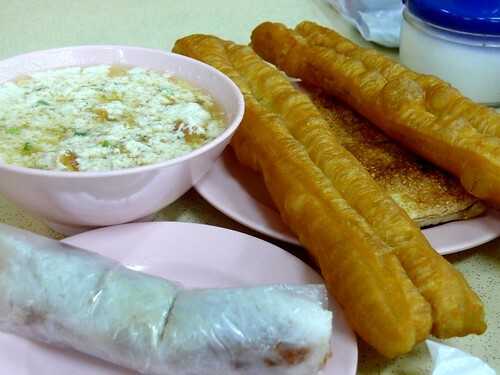 Now, of all the Shanghainese food, salty beancurd soup (xen dou jiang) is my top dislike, plus sticky rice rolls (tze fun), which is Shanghainese sushi. 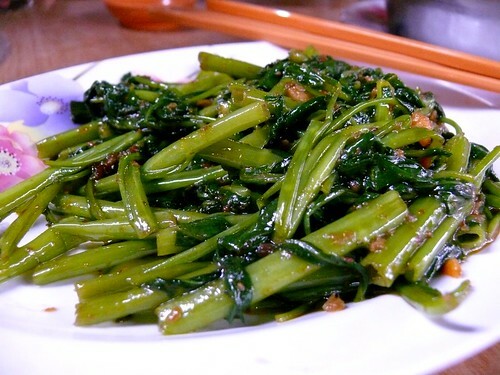 The only thing that my MIL cooks which I don't eat (but my kids do) is chow doe jiang, which is firm beancurd, mushrooms, meat, bamboo shoots etc fried in a hot fermented bean curd sauce. Years ago my older BIL found a Shanghainese restuarant called Yong He in Geylang, and since then whenever any of the family visits Singapore, he'd go there for a meal. But I won't even give you the address because I think the food's really horrible! The xen dou jiang (top left) is beancurd jelly (or you can choose soy bean milk) with soy sauce, sesame oil, some spring onions and ja cai, a preserved veg. Because I'm used to eating sweet beancurd jelly, eating the salted version feels weird. The feeling is like eating salty ice-cream I suppose. In the front, wrapped in plastic, is tze fun (sticky rice) which has meat floss and ja cai. Nope, not for me. I spat out the first bite of the crullers (yew tiaw); it tasted and smelt of ammonia! It amazed me as my Hub and his bros continued eating the stinky bread. 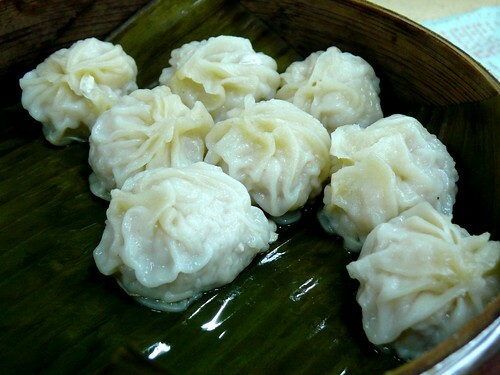 This, would you believe it, is xiao long bao. As wrinkled as me on a winter day. Geylang is the red-light area of Singapore. Yes, even squeaky-clean Singapore needs hookers. It was an eye-opener for Ming and I to see the girls standing by the roadside and soliciting business with any car (driver) that slowed down on the road. We were told that if we walked the side streets, the girls would literally grab any guy who walks by. There were streets of Thai girls, Indonesian girls, Filipinas, but most of all, there were girls from China. And these girls from China were very bold, sitting out having dinner at the restaurants, clinging to their 'johns' , very old dirty men. The girls aren't that young themselves. We were told (by the taxi driver) that younger girls don't walk the streets, they stay in apartments above the shops and you can tell they are there because they would light up red lanterns that dangle from the windows. 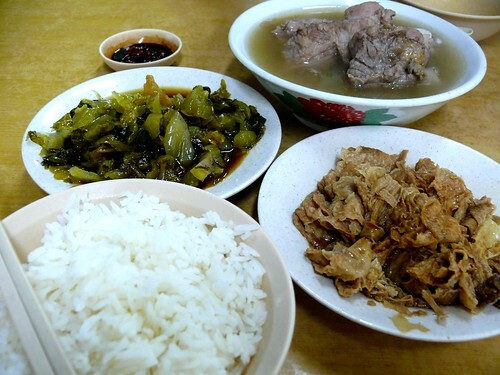 Bak kut teh (herbal pork ribs soup S$5), with side dishes of beancurd skin (S$2) and preserved veg (S$2). After dinner, we walked along the streets trying to get a cab. I was told that the girls would lay off if they see a female with a group of men, so I hung back a little, and sure enough, I saw a girl talking to Hub as he walked by. Ming was totally disgusted, but I felt very sorry for them, so far from home and doing what they were doing. Ming brightened up when we came to a large durian stall. 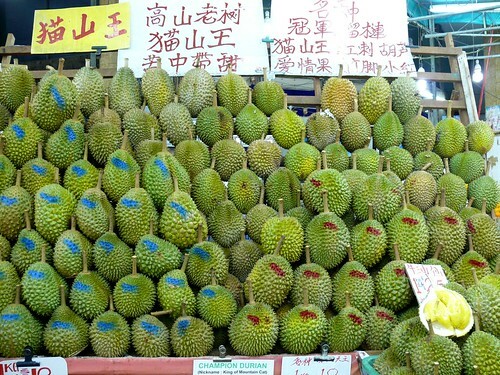 We chose a Buddhist-temple-sounding durian, the maw san wang which, as I look at the pic (and feel very proud that I can actually read 3 Chinese characters) really means 'cat mountain king' whatever that means (S$8/kg) and another one (S$12/kg) recommended by a guy who looks like a loan shark, or a robber. You know, the scary-face type. 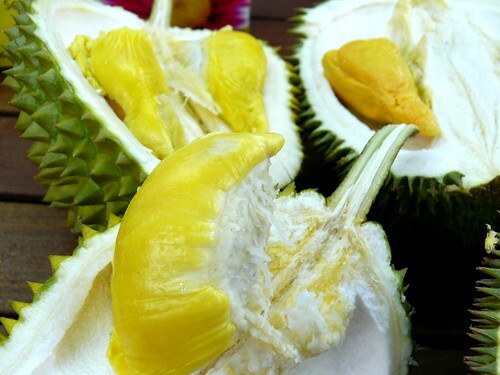 When the durians were opened, I was taken aback by their color: a bright sulphuric yellow to a golden yellow. 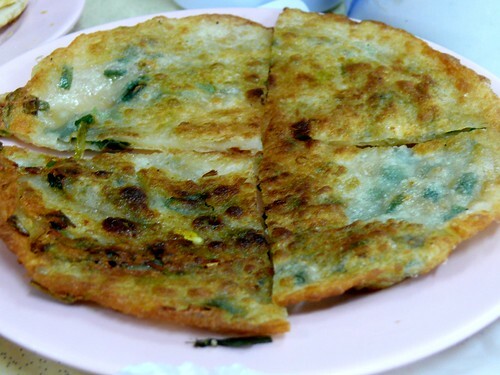 Thick-fleshed, strong;y-flavored, creamy and sweet but slightly over-ripe and mushy. I was so full I had to seal my lips by pressing them close with my fingers to keep the food from coming out. Bernard and Aihua insisted to take us to Kuishin-Bo, Suntec City Tower 1, for quality Japanese buffet that costs only S$20.90++, if you finish within 60 minutes. If you extend beyond that, you pay S$29.90++ which is still not expensive. You'll need to book because the office crowd rolls in for lunch as early as 11:30 am. Any impression I had of anorexic stick-insect-like Sing girls and guys was totally dispelled that day as most of the diners were young working adults. 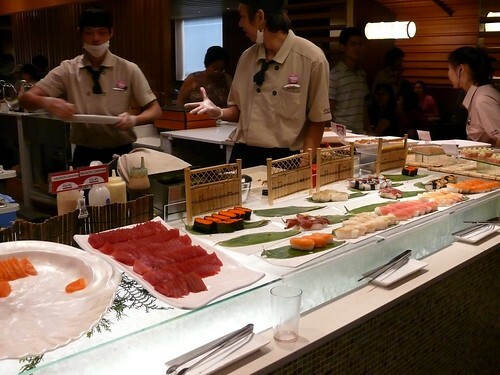 I must say for the price the buffet was really good, with a big selection of sushi, sashimi, noodles, soups, tempura, teppanyaki, nabes, boiled seafood like clams, mussels and snails. Dessert was good too and there was a large selection of teas. 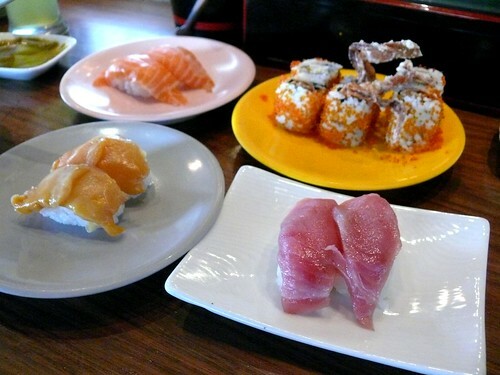 I started with a selection of sashimi and sushi. There were many more varieties of sushi and sashimi but I was wary of the rule regarding unfinished food (can't remember how much but there's a fine). I also had their clam chowder, which tastes of packet soup but with lots of seafood and clams, and their teapot soup. Not in pic was their chawan mushi (steamed egg) which was excellent, silky smooth and soft with just the right amount of dashi. It reminded me to perfect my chawan mushi because I can't make it that silky. 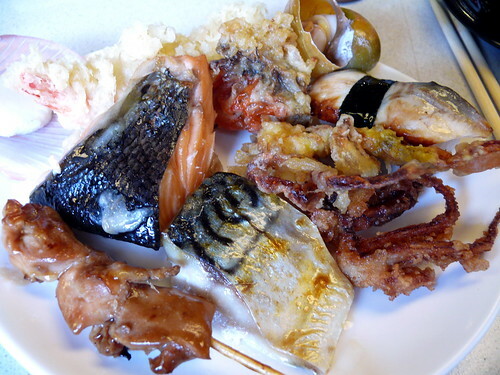 My next selection included tempura soft shell crab, prawns, squid, grilled salmon and saba fish, and chicken yakitori. At the back is some kind of snail which Hub ate by the platefuls. He said it had the texture of abalone. Ming was going at the clams and scallops by the platefuls too but I don't like seafood that's been frozen. 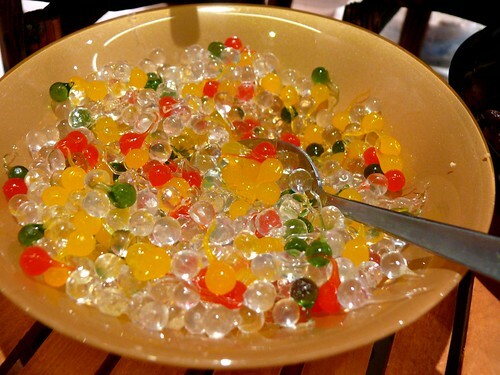 I would describe this as jelly caviar. 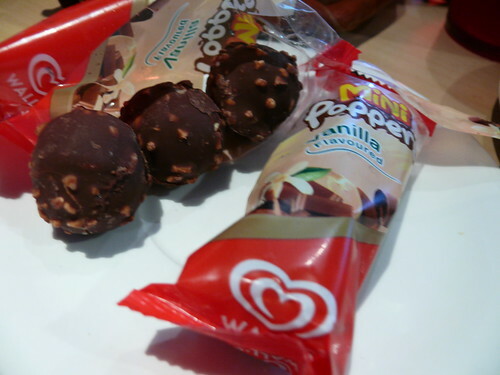 These little balls give a good bite and are so fun to eat with vanilla ice-cream. Wish I could have some now.